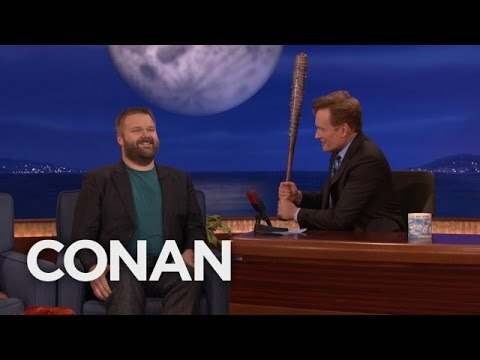 Robert Kirkman, graphic novelist and creator of The Walking Dead, was one of the guests on last night’s Conan episode. One of the first things Conan pointed out was that they now sell Negan’s bat, and while the “barbed wire” is rubber, the bat portion is quite functional. Another Walking Dead product Conan found questionable was the existence of college classes centered around the show. When he informed Kirkman of these, he asked for his thoughts. “Well, that is flattering, but also stupid,” was the answer. 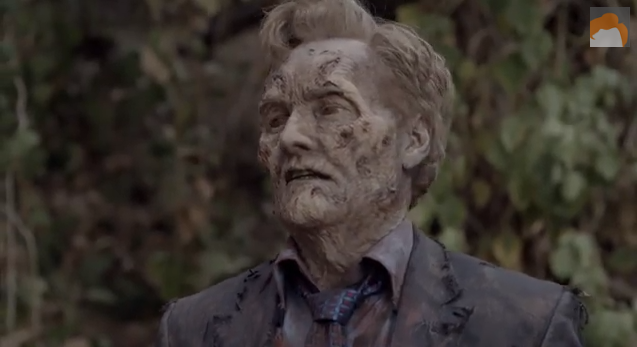 Conan asked Robert why nobody ever calls a zombie a zombie in the Walking Dead universe. Kirkman replied that if there had already been zombie literature out there prior to the outbreak, everybody would know what to do. The lack of the word “zombie” implies the concept did not exist prior to it actually happening, and therefore nobody was prepared. For a bestselling writer whose creation is now the current #1 TV series and a merchandising goldmine (lots of bats!) Kirkman tries to keep his perspective humble and grounded. He says it’s easy to do when you have low self-esteem to begin with. Conan O’Brien and his shenanigans appear four nights a week on TBS.